looks like a pretty good mix. So what genre do you like most? Just curious. 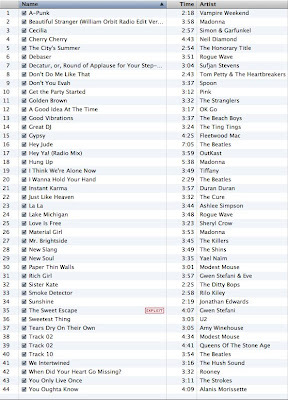 ps how'd you save your play list as a jpg? Ohhh that has some stuff on it I haven't heard of, which means I should download and see what they are. i love that your sufjan stevens song is "decatur." i love that whole album but that song is so whimsical, funny, and meaningful at the same time, it's genius! good for you having that on your playlist! erica - i don't think i have a favorite genre really. i'm all over the board. i love just about everything and anything. the beatles & james taylor, i have a thing for 80's music (you can't beat tiffany) to rage against the machine. i just went to a cold play concert, so they are my new fav. although we're going to bloc party next week & then the ting tings. so... that could change soon. as for the playlist jpeg: i'm not sure if it'll work on pcs,but it works on my mac... i just take a screenshot by pressing shift, command and the number 4 all at the same time. & jomama- decatur is the best! i LOVE it. any of you have any favs i missed?